There are not enough words to thank Alysia Christiani for all that she did to make this program move forward. She delivered an incredible workshop for the children and for MCF. Alysia is Studio Manager at Sesame Workshop in New York but in addition to her management and organizational skills she is Guyanese American! She felt right at home in Georgetown! The children broke into groups to work out the logistics of the photography assignment. Each participant was outfitted with a backpack, a journal, a point and shoot camera with video capability and memory card, a camera carry case and a t shirt and photography book. The participants were also given back to school pencils, pencil grips, paper clips, erasers and so on. Of course the cameras were the big hit! 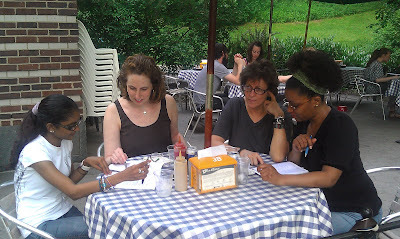 Weekly meetings with Project Director Nancy Stevenson, Project Manager Alysia Christiani and Margaret Clemons in Central Park made the planning fun and easy. 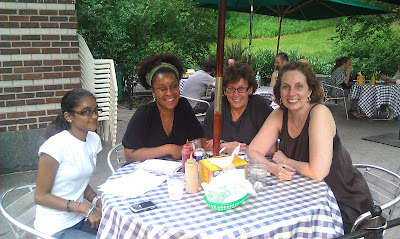 In this photo Kristine Morgan joined the planning team to offer ideas for the roll out in the fall. Kristine also served as a Team Leader for the project. Minister Manickchand posed with the workshop participants all of whom wore the WITNESS T shirts. A big thanks to artist Vanessa Germosen for having designed a most incredible project logo!!! Check out the t shirts the children are wearing in this picture! The Margaret Clemons Foundation (MCF) is a New York based non-profit organization with a mission to stop gender and child directed violence through arts based teaching, training, therapy, and community outreach. Visit our website to learn more about the foundation.